In Luma’s ”micron world” everything starts with the customer. Creating longlasting ”sustainable” business relationships lies in the nature of our business because it often takes a long time to create products which meet our customers demands. Once done our customers / partners would stick to Luma for a long time. All stakeholders connected to Luma´s activities – suppliers as customers – are actively involved in our processes. Often Luma customers themselves come for audits and updates of quality routines in order to secure standards, to improve or change qualities or to be part in developing new products especially designed for their needs. During these processes we follow consequently ISO 9001 and ISO 14001. Luma has created a designated quality department for this purpose. Luma respects and applies human rights. Luma creates a healthy and motivating working environment and develops competences of it´s employees. Luma exports nearly 100 % of it´s products potentially to all parts of the world. 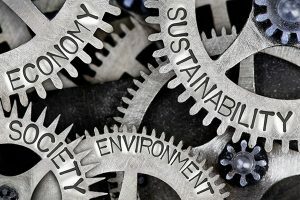 Thus Luma has to apply sustainablity principles not only on an individual and corporate level but also – especially in Luma’s case – seen from a global perspective. LEAN management helps us a lot in keeping up with these demanding tasks. Luma applies LEAN principles since 2011. Increase the positive impact that our products, services and technologies contribute to a cleaner, healthier world. Innovation potential is a key factor. Increase our work within our local communities – support local business, e.g. by: placing local adds, offer vacation jobs, outsourcing parts of our production processes to local companies if possible. Support Research and Development at regional and worldwide Universities in order to create new technical possibilities for a more healty environment in future. Our environmental policy refers to external environment and working environment. For Luma´s employees this means in first line avoiding waste of energy. It often happens that production processes have to be adopted according to product requirements. 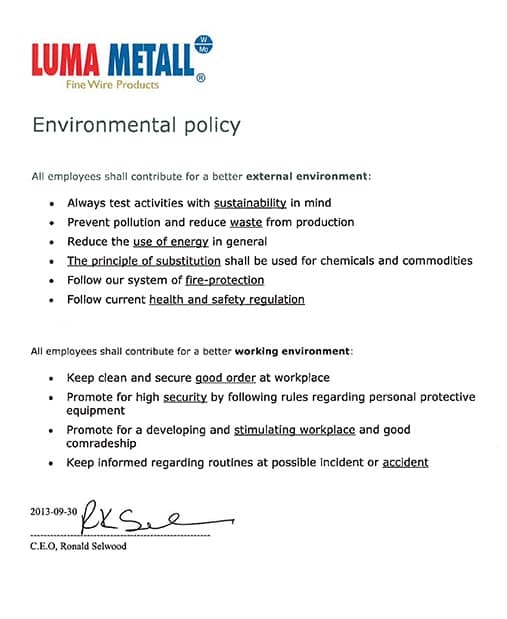 Thisregarding our employees always shall have sustainability principles in mind. New production methods or set ups are to be checked according to sustainability principles. As Luma employs highly educated staff and because it takes a quite long time to get used to internal production processes and handling routines it is crucial that all staff feels well and motivated. Luma invests a lot of time and cost in education of our employees and wants them to stay for a long time during their professional life. Therfore security, stimulating working places and an open and communicative atmosphere are extremly important to Luma. Luma applies ISO 9001 and ISO 14001. Our quality policy applies to both: product characteristics and service competence including internal services. Permanent and frequent testing during production is part of our routines. 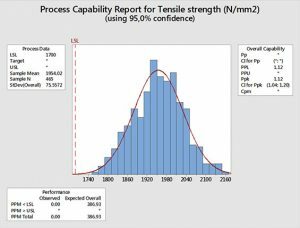 Many different kind of tests apply as a standard: Spiraltesting, UTS (Ultimate Tensile Strength, Straightness, Ovality, Resistance, Weight. Others are performed according to customers special demands. In our Plating department there are 3 quality key factors: surface derivations, strength of the plating layer(s) and adhesion (addition). For different kind of material analysis we use very advanced technology such as SEM, AAS and EDS equipment. By quality referring to internal services we mean to perceive ourselves as inter-clients when receiving deliveries / information from an earlier process might it be in production or on the administrational side. Luma follows the principals of LEAN Managment in order to achieve the best quality results on different levels and make all processes as efficient as possible. Selfevidently Luma takes responsibility for every single spool of Fine Wire that leaves our production. We call it ”Product Stewardship”. During the manufacturing process every single step is documented to make sure that nothing goes wrong when our Wires are used in different applications or to detect the most minor irregularities in the Wires characteristics. This is also done by frequent different testing during production, e.g. As part of our commitment to sustainability, we fully acknowledge that all the chemicals we use and produce must be managed responsibly. 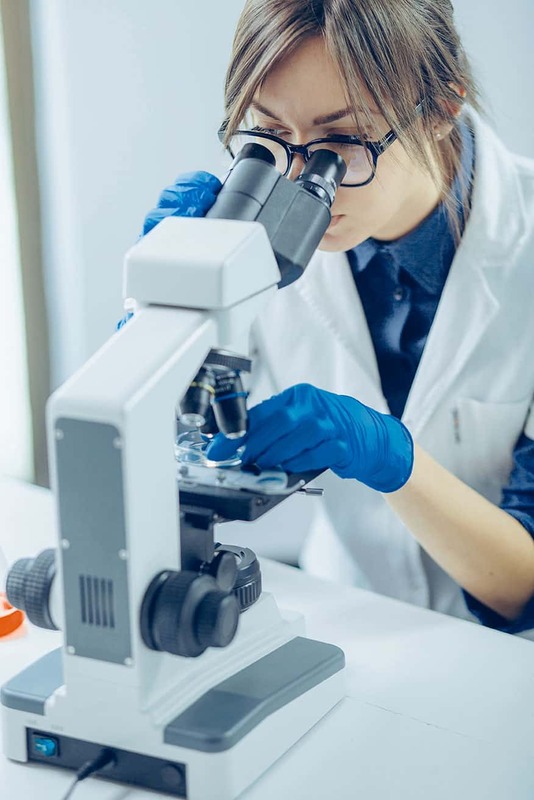 This is to ensure sound management of chemicals throughout their complete life cycle, so that chemicals are produced and used in ways that minimise significant adverse impacts on human health and the environment. For example: At Luma we work a lot with gold. Our annual need for plating our Fine Wires is considerable. Consequently parts of our production outcome will be waste because of various reasons. We don´t waste gold, though. Instead we seperate gold from the waste wires by using advanced inhouse developed technology and return it for re-use to our suppliers. Classified as a top priority project in 2018 and 2019 SPC – Statistic Process Control – is stepwise implemented in production as well as in service processes in order to increase quality, productivity and thus competitiveness. It implicates a better working environment and more motivated employees. By focussing proactively on key market segments which will contribute to Luma´s growth and well being in future we try steadily to create more use and worth for our customers. That way we hope to be able to maintain and find new longlasting ”sustainable” business relationships and to use our full innovation potential together with our customers.